For a mouse, being placed in another mouse's dirty cage induces stress and a rise in blood pressure. If stress is giving you high blood pressure, blame the immune system. T cells, helpful for fighting infections, are also necessary for mice to show an increase in blood pressure after a period of psychological stress, scientists have found. The findings suggest that the effects of chronic stress on cardiovascular health may be a side effect of having an immune system that can defend us from infection. The results also have potential implications for treating both high blood pressure and anxiety disorders. The results are published in the journal Biological Psychiatry. Marvar began his research under the guidance of David Harrison, MD, who moved from Emory to Vanderbilt University in 2011. He completed his work in the laboratory of Kerry Ressler, MD, PhD. Ressler is a Howard Hughes Medical Institute investigator and professor of psychiatry and behavioral sciences at Emory, and maintains a laboratory at Yerkes National Primate Research Center. In the current study, researchers subjected mice to psychological stress by confining them in a small space for one hour and then putting them in cages where other mice had already left their scents. Two hours of stress per day, for a week, results in a short term rise in systolic blood pressure in normal mice. However, mice that were genetically engineered to lack T cells did not display an increase in blood pressure under the same regimen. Introducing T cells into mice that lacked them made their blood pressure sensitive to stress again. 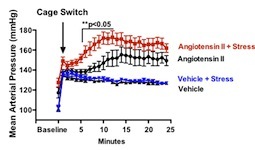 Harrison and his colleagues had previously shown that T cells are needed for the increase in blood pressure coming from high dietary salt or the hormone angiotensin, which regulates blood pressure, and continue to investigate the role of T cells in high blood pressure. Several studies in animals have suggested that medications now used to control blood pressure, such as angiotensin receptor blockers or ACE (angiotensin converting enzyme) inhibitors, may also be helpful in the reduction of stress and anxiety, Marvar says. “Further understanding the mechanisms underlying these observations and determining whether they may benefit people with anxiety disorders, for example post-traumatic stress disorder (PTSD), is a current goal of my research,” he says. High blood pressure is a risk factor for heart attack and stroke, and many people take medications to reduce their blood pressure. Yet some find that medications are not effective in controlling their blood pressure, and researchers are investigating various alternative approaches. The research was supported by the National Heart, Lung and Blood Institute and by the Emory University Scholars Program in Interdisciplinary Neuroscience Research.